Caption slip reads: "Photographer: Olmo. Date: 1955-11-05. Reporter: Adler. Assignment: Helen of Troy. 73/74: Cynthia A. Dixon, 20, the 1956 Helen of Troy. 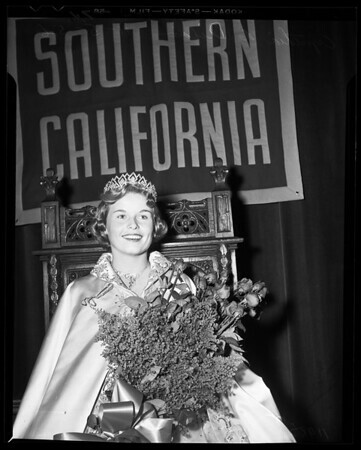 71/72: l to r Dr. A.S. Raubenheimer, educational vice prexy at USC, crowns Cynthia A. Dixon, 20, as 1956 Helen of Troy."